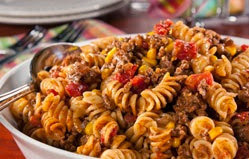 You can add a little Mexican flair to your next pasta dish by using ground beef, corn, and taco seasoning. The flavors of this dish are so very wonderful. You can use your own favorite taco seasoning in this dish and this dish is just simply packed with flavor. In a large soup pot over high heat, brown ground beef and onion 8 to 10 minutes, until no pink remains in beef and onion is tender. Add remaining ingredients except pasta; mix well. I like to serve this dish with a green tossed salad and Cheddar Bay Biscuits. Click the biscuits link for a great recipe. 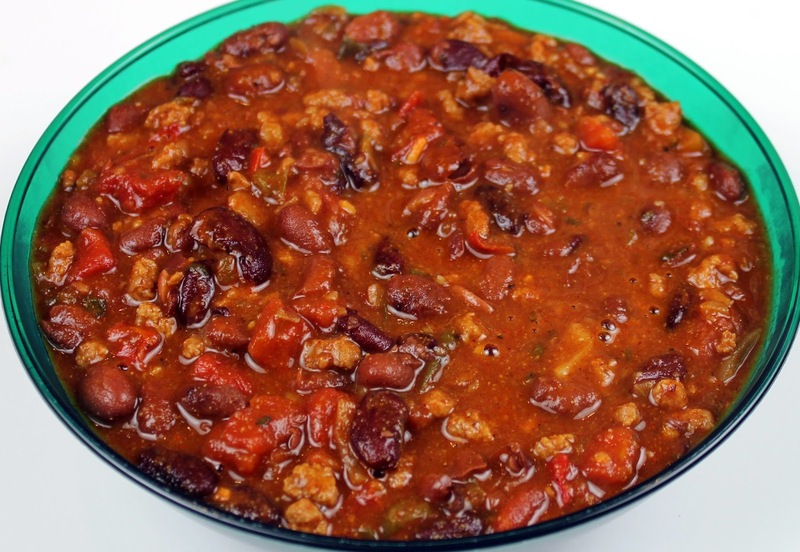 According to Frank Tolbert, who immortalized Texas Chili in A Bowl Of Red, the authentic, original recipe included beef, hot peppers, oregano, cumin, and garlic- but no beans. Beans are now considered to be acceptable, but "chili heads" are a contentious bunch. Their current controversy beans in the chili or served alongside. In the deep chili purists pockets of Texas especially around San Antonio considered by many to be the birth place of chili you would still find people telling you that beans should be served on the side and never in the chili. 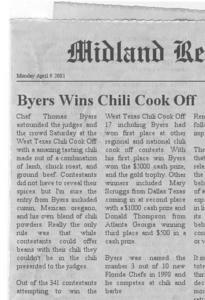 But as I look around Texas I see more and more beans finding their way into the pot of chili. In this recipe we have it so the beans can be added to the chili or served on the side. 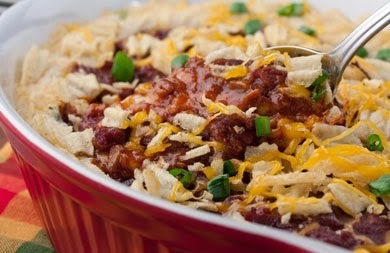 Either way I think you'll find the chili produced by this recipe to be oh so delicious. 1. 1 1/2 Pounds Boneless Beef Top Round Steak. 2. 1 Tablespoon Cooking Oil. 3. 1 Cup Fine Chopped Yellow Onion. 4. 2 Tablespoons Minced Fresh Garlic. 5. 2 Sixteen Ounce Cans Diced Tomatoes Pureed Smooth In Blender Or Food Processor. 6. 1 Four Ounce Can Diced Green Chilies. 7. 2 Tablespoons Chili Powder. 8. 1 Tablespoon Brown Sugar. 9. 2 Teaspoons Crushed Dry Oregano. 10. 1 Teaspoon Ground Cumin. 11. 1 Teaspoon Ground Sea Salt. 12. 3 Cups Hot Cooked Buttered Rice. 13. 4 Cups Cooked Pinto Beans. 14. Fine Diced Sweet Onion For Garnish. 15. Shredded Mexican Cheese For Garnish. 16. Sour Cream And Guacamole For Garnish. 1. Start out by partially freezing your meat. 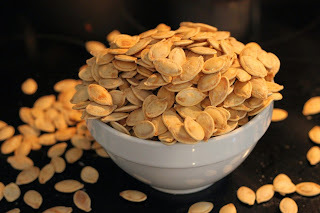 Then thinly slice it against the grain into bite size pieces or cut it up into 1/2 inch cubes. In a Dutch Oven brown half your meat in hot oil. Remove the browned meat from the pan. 2.Brown remaining meat with the onion and garlic, adding more oil if necessary. Drain off the fat. Return all meat, onion, and garlic to the pan. 3. Stir in the tomatoes, beef broth, green chili peppers, chili powder, brown sugar, oregano, cumin and salt. Bring the mixture to a boil and then reduce the heat. Cover and heat on medium high heat for about a hour or until the meat is tender. 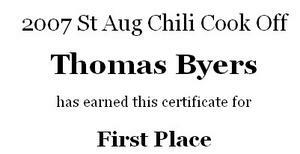 You can if you want a thicker chili add a six ounce can of tomato paste near the end of the cooking time. 4. Serve with your sides over squares of corn bread in bowls. 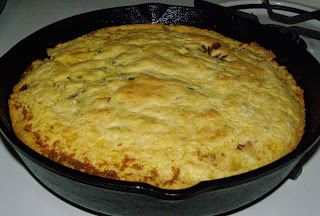 Corn Bread, In the south cornmeal is white, and yellow corn meal is dismissed as inferior. One nineteenth-century woman complained that in the corn bread she encountered on her travels outside the south, yellow corn was often used and the meal was too fine, which made a clammy bread. 1. 1 1/4 Cups White Corn Meal. 3. 1 Tablespoon Baking Powder. 4. 1/4 Teaspoon Baking Soda. 5. 1/4 Teaspoon Ground Sea Salt. 8. 1/4 Cup Raw Honey. 9. 2 Tablespoons Butter Or Margarine Melted. In a mixing bowl stir together corn-meal, flour, baking powder, baking soda, and salt. In another bowl beat together eggs, buttermilk, honey sand melted margarine or butter. Add to cornmeal mixture and stir until just well mixed. Don't over mix as it will make your cornbread tough. Pour into a greased 9 X 9 X 2 inch baking pan. Bake in a 425 degree oven about 20 minutes or golden brown. Cut up into small squares and serve. You now have real authentic southern corn bread just like was made in the old south. If your looking for a really great recipe for Flourless Peanut Butter Cookies then you need to check out this recipe. I promise you it is truly one of the best recipes in the world. 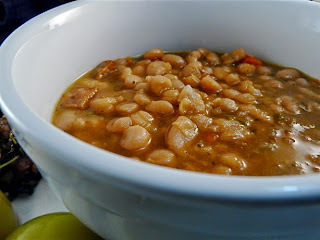 Here is a delightfully delicious recipe for White Bean Soup. These white beans turn out just perfect in the crock pot. When I cook something in my crock pot I always spray the interior of the pot with vegetable cooking spray to make clean up easy. I always serve a loaf of French bread that I have heated in the oven until it is hot. I cut up the French bread in small pieces before I serve it with the beans. I usually serve my beans in individual bowls and I garnish the top of each bowl of soup with a sprig of fresh parsley. 1. 1 lb dried navy beans, rinsed, checked for stones and dirt. 2. 1 tablespoon olive oil. 3. 1 lb smoked pork sausage, sliced into 1/2-inch pieces. 4. 2 cups diced onions. 5. 1 1/2 tablespoons minced garlic. 7. 2 sprigs fresh thyme. 8. 8 cups chicken stock. 10. 2 teaspoons ground sea salt. 11. 1 1/2 teaspoons fresh ground black pepper. 12. 1/2 teaspoon ground cayenne pepper. 13. 1 loaf crusty bread, to serve with the beans. 14. Fresh parsley for garnish. 1. Soak beans in cold water to cover, overnight (8 to12 hours). Drain beans and rinse well. 2. In a large stockpot or Dutch oven, heat the olive oil over medium-high heat. Add the sausage and saute for 5 to 6 minutes, or until browned. Remove the sausage from the skillet and reserve. Add the onions and cook 2 to 3 minutes, stirring occasionally. Add the garlic and cook, stirring, an additional minute. 3. Add the browned sausage back to the stockpot. Stir in the beans, bay leaves, and thyme. Add the chicken stock, water, salt, pepper, and cayenne. Bring soup to a boil; reduce heat to a simmer and cook, partially covered for 2 1/2 to 3 hours, stirring occasionally. Skim off any fat, as necessary, if desired. (The cook time may vary depending on the beans, but they should be tender and falling apart when finished.) Remove the bay leaves at this time. 4. Adjust seasonings with salt and pepper, if needed. Using a potato masher or the flat side of a spoon, gently mash the beans against the bottom and sides of the stockpot, leaving some of the beans whole and some mashed. Continue to simmer the soup for 30 minutes, uncovered, or until desired consistency. 5. Ladle the soup into bowls. Serve hot, with crusty bread slices. Garnish the top of each bowl of white beans with sprigs of parsley. I think the little bit of cayenne pepper gives the white bean soup a wonderful flavor. If you think it would leave your white beans too spicy leave it out. I think it gives the white beans a lot of wonderful flavor. 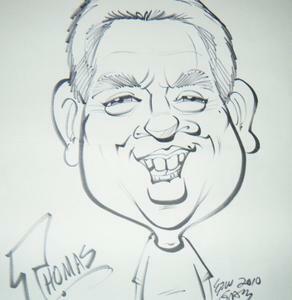 This post is by Thomas Byers. If you need to contact us about this post write to the below address. 114 Wells Road, Lawndale, N.C. If your looking for a super hearty stew to cook in the crock pot then listen. 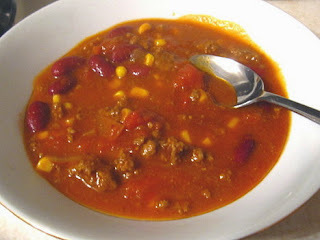 You need to make this delicious recipe for Ground Beef Hobo Stew as soon as possible. This makes a oh so wonderful main dish meal that almost everyone who tries it loves it. Its packed with ground beef, carrots, tomatoes, corn, green beans and more. If you don't like an ingredient leave it out. If you want to add an ingredient then by all means add it. I sometimes add thin sliced fresh okra to the stew and people just love it. I like to serve my Ground Beef Hobo Stew over huge squares of corn bread in large soup bowls. Those flavors just go together perfect. Try it one time and I bet you'll make it again and again. 1. One Tablespoon Of Vegetable Oil. 2. One Cup Fine Diced Yellow Onion. 3. One Half Cup Diced Sweet Green Bell Peppers. 4. Four Large Jalapenos Diced Fine With Seeds And Membranes Removed. 5. One Tablespoon Fresh Minced Garlic. 6. Two Pounds Ground Beef Browned Well And Drained Very Well With Two Tablespoons Plain Flour ( See Note Below ). 7. Three Cups Beef Stock. 8. Three Large Potatoes Peeled And Diced Fine. 9. Two Cups Fine Diced Peeled Fresh Carrots. 10. Two Cups Fresh Or Frozen Whole Kernel Corn. 11. One Fourteen And One Half Ounce Can Diced Tomatoes. 12. Two Cups Green Beans. 13. Four 11.5 Ounce Cans Spicy V8 Juice. 15. One Teaspoon Ground Black Pepper. Note About Plain Flour Mixed In Ground Beef. Once you have browned the ground beef in a skillet and drained it very well mix in two tablespoons of plain flour being sure to stir it in very well. You'll want to cook the onion, garlic, and peppers in a skillet in the vegetable oil until they are soft but not browned. Now spray the inside of the crock of your crock pot very well with vegetable cooking spray and then add all the ingredients into the crock pot. Put the lid on the crock pot and turn the crock pot on high. You'll want to cook on high for about six hours and resist the urge to peek while the stew is cooking. At the end of six hours stir the Ground Beef Hobo Stew up well and taste to see if you need to add salt or pepper. You can if you want to add Italian Sausage browned and cut up in small pieces, shredded cabbage, pinto beans, black eyed peas or etc. I sometimes cook pasta shells and add a few to each bowl of the stew before I serve it. There is really nothing you can't add to the stew or take out of the stew. No recipe is written in stone and in the old days the hobo's in the hobo jungle would have added what ever they had on hand to the Ground Beef Hobo Stew. Please share this post with social media, your family, friends and etc. Thanks in advance. 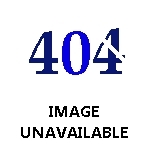 This post is by Thomas Byers. If you need to get in touch with us about this post please write to us at the below address and include the link to the post. 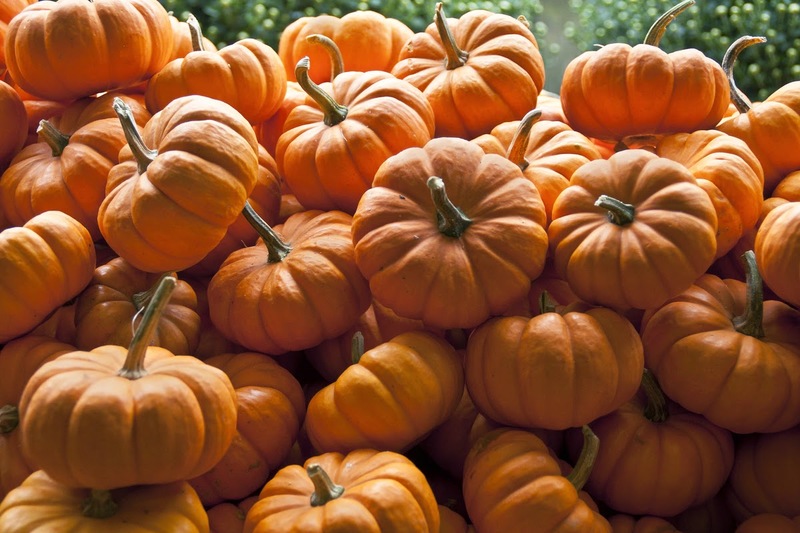 Here we have a delightfully delicious recipe for Pumpkin French Toast. If you love French Toast then you need to make this delightfully delicious recipe for Pumpkin French Toast. 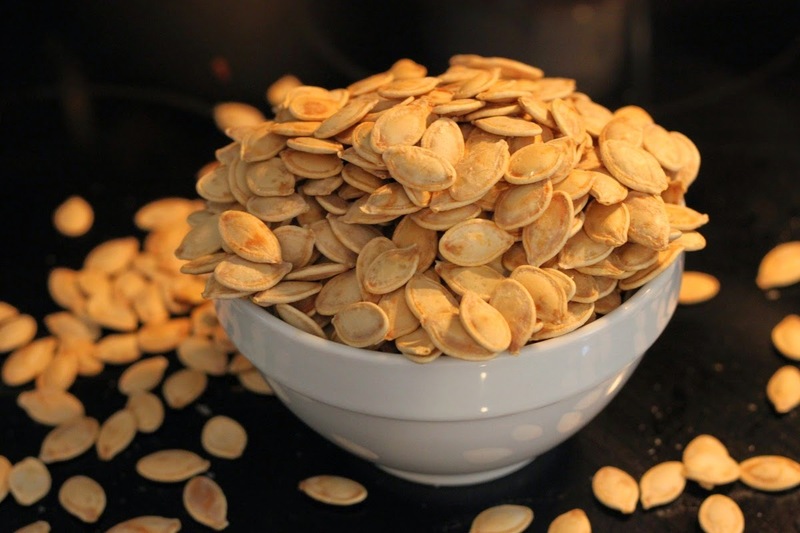 It's a real easy recipe to make and its also really good for you. I don't know if you know it but pumpkin is a super food and it is filled with all kinds of great anti oxidants. And did I mention that Pumpkin French Toast is oh so delicious. I have a small grill that I use at home for making French Toast, frying eggs, cooking breakfast meats and etc. They are also really great for making pancakes. Butter griddle and dip bread into egg mixture (allowing a few seconds for it to absorb mixture. I also squeeze gently to soak the mixture to center), then rotate and coat opposite side. Transfer to griddle and cook until golden brown on bottom, then lift, butter griddle once more and flip french toast to opposite side and cook until golden brown. 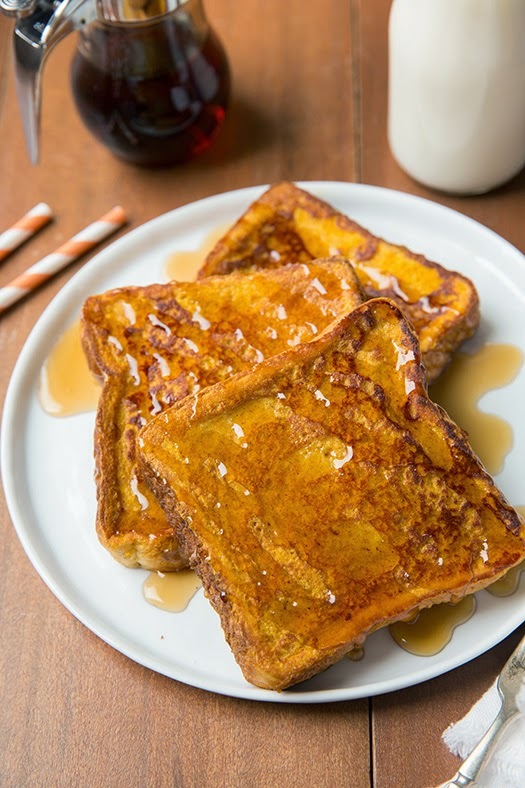 Serve warm with butter and maple syrup. A fiber-rich diet seems to help people eat less, and thereby shed pounds. A 2009 study found that people who ate a whole apple before lunch (the fiber is in the skin) consumed fewer calories throughout the meal than people who ate applesauce or drank apple juice. Please Share This Post With Your Family, Friends, And Social Media. Please pin our pictures to Pinterest. Please send the link to this post to your family, friends, and online contacts. Thanks very much for your time.